Everyone should own some sort of bedside clock to help them keep time whenever they snooze late into the morning, or just to know at what bewitching hour they keep on getting up at night, as though there was some sort of spiritual force oppressing them, so that they can share all the details with the visiting exorcist. Well, other than that, just simply having a clock is a must for any home, as time and tide wait for no man, so keeping the correct time always is essential. Better yet, why not if your time keeping machine also has more than one basic functionality built in, like the Time & Wireless Charging Station? This smart clock will do far more than just tell you the time, as it will also come with a weather station, projection clock as well as charger that does things the wireless way. Basically, it will play nice with Qi-enabled wireless devices, now how about that? 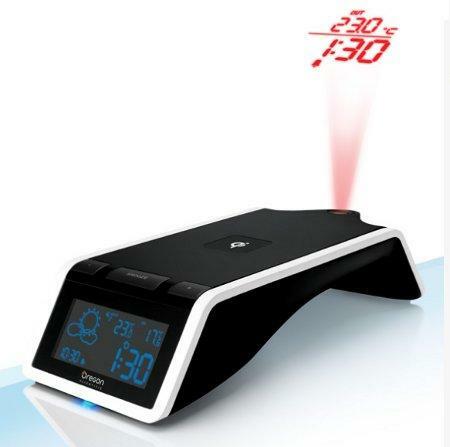 This radio-controlled clock will depict the indoor temperature and boast of a 5-channel outdoor temperature display, sporting a 2-minute crescendo and 8-minute snooze alarm function, and a magnet-free charging pad that paves the way for greater freedom of placement for devices while charging. Sounds like the ideal way to usher 2013, no? YOWZA!.. Looking at their site, this model isn’t listed yet, but the next closest is $1500! Their cheapest projector clock is $600… really? Did my site not get loaded right and the currency conversions are way off?? That is ridiculous. Think I’ll stick with my phone that displays and speaks the weather but doesn’t cost more than my bed.